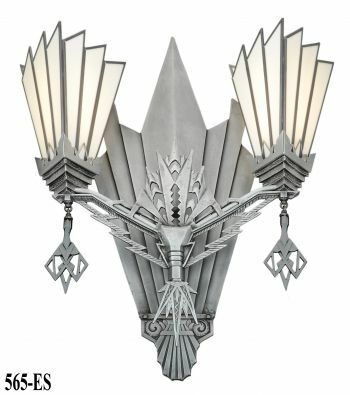 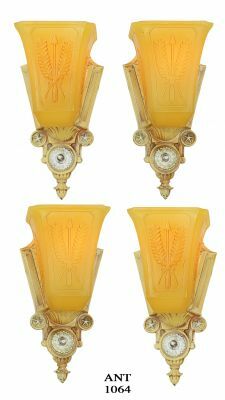 Fantastic Art Deco or Art Nouveau impressive French chandelier. 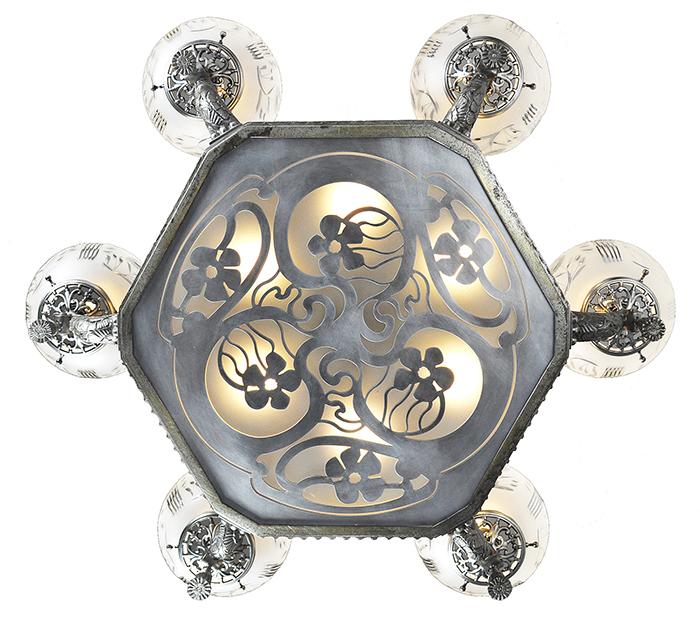 Really quite lovely. Ah, the French...they sure did like their gorgeous amounts of design and elaboration. 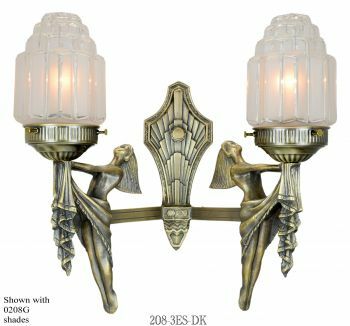 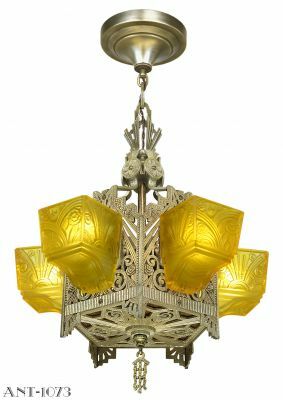 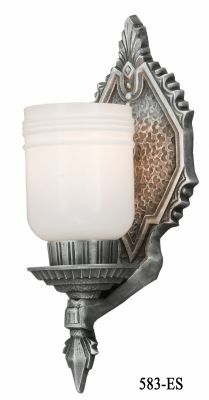 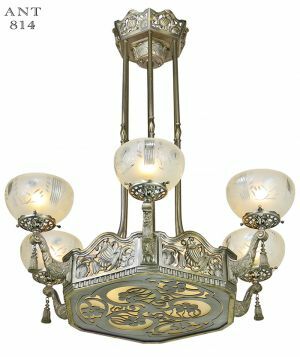 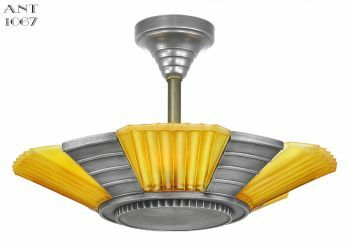 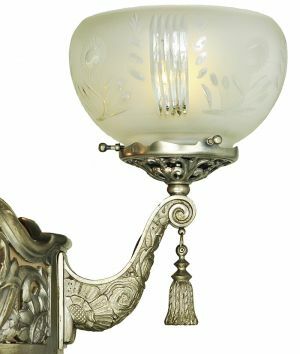 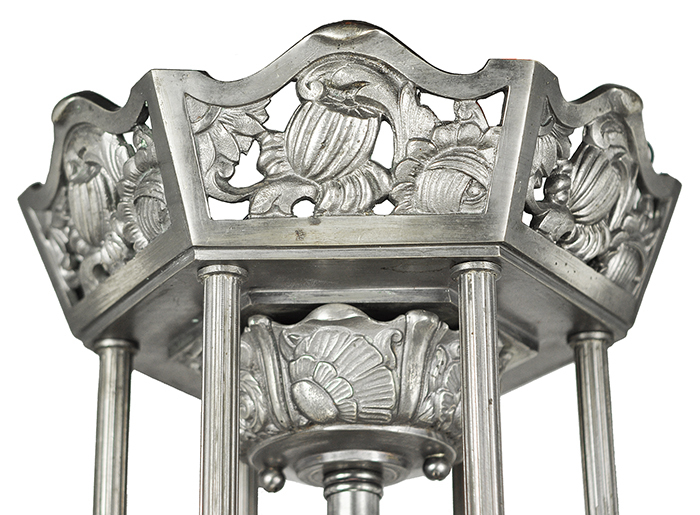 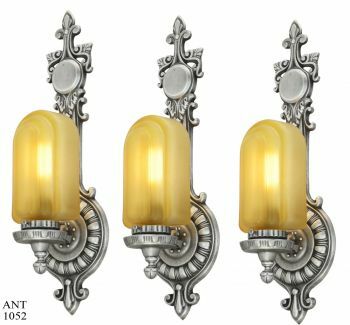 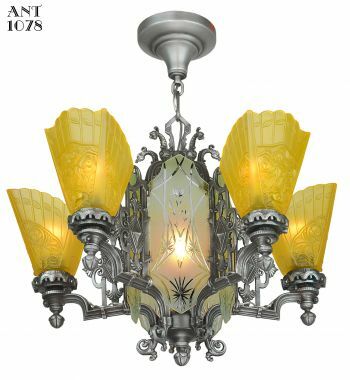 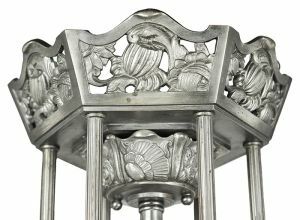 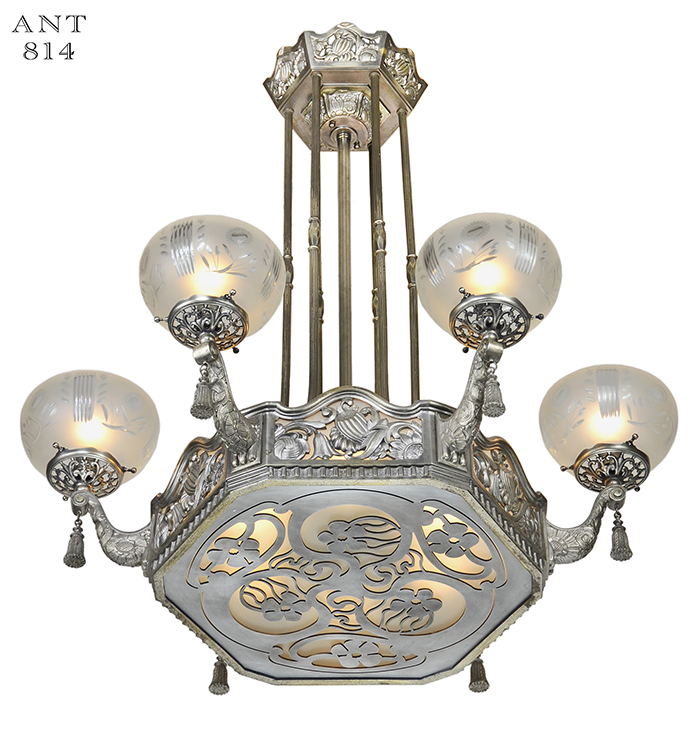 Here we have a fine chandelier that has elements of Art Nouveau and Art Deco together in one lovely fixture. 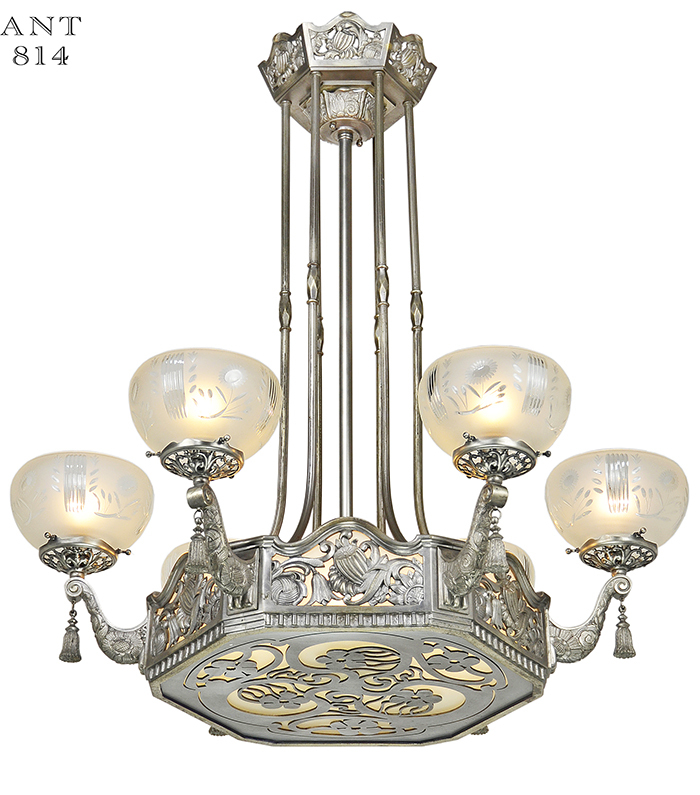 Circa 1920 - 1930, it is truly a lovely chandelier. 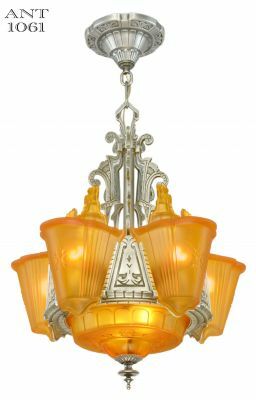 When we finished re-wiring it for American sockets and re-doing the wiring, we all just stood there and admired this beauty. 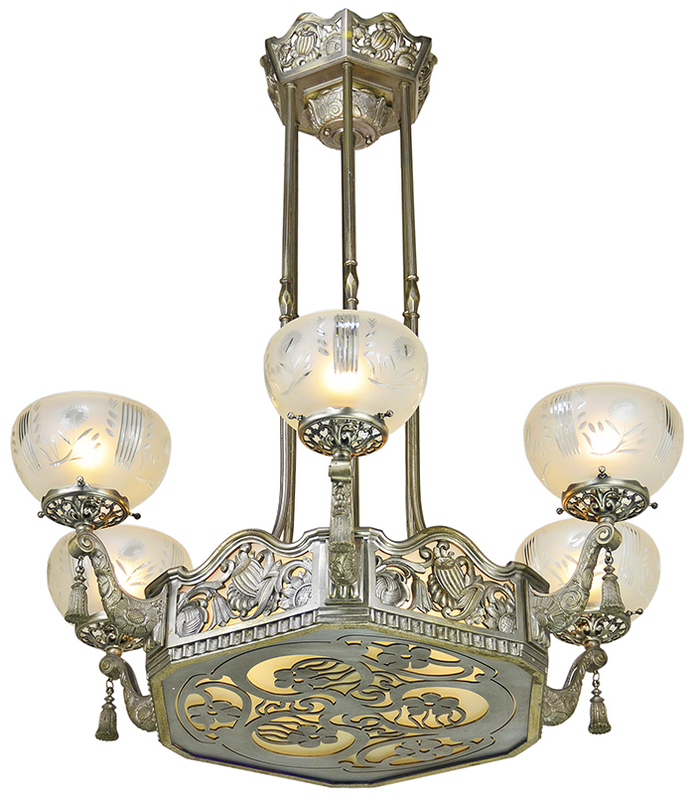 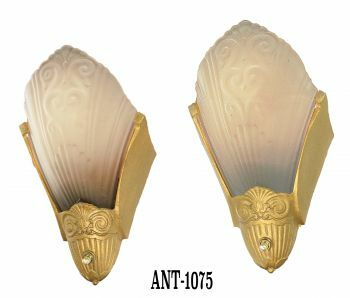 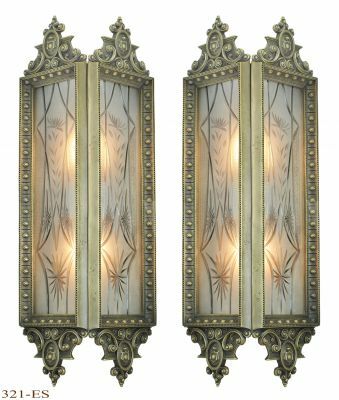 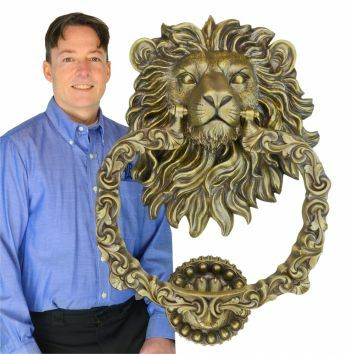 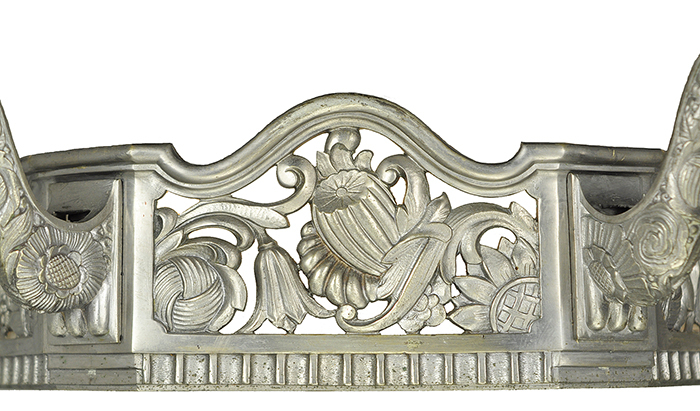 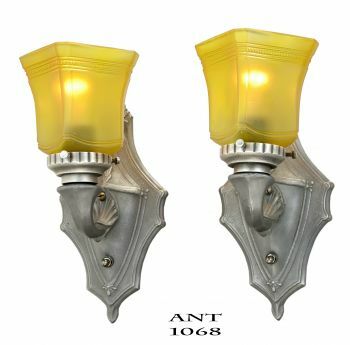 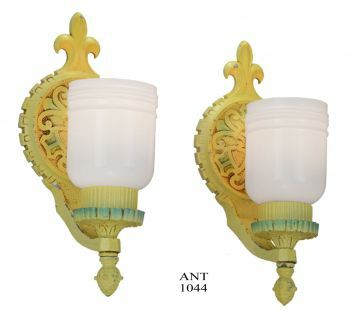 The metal is all cast brass/bronze with an old silverized finish that was done during the Nouveau and Deco periods. 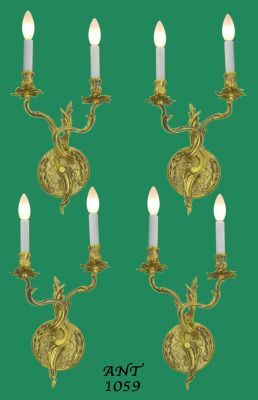 And the French did this finish the best, bar none. We took our pictures with low output 2 watt LED bulbs so the fine details of this chandelier could be seen clearly and not get blown out by too strong bulbs. 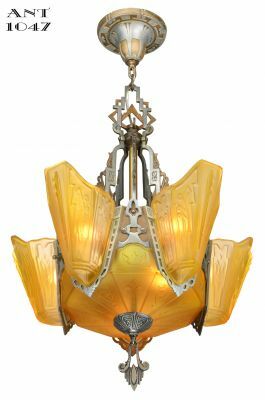 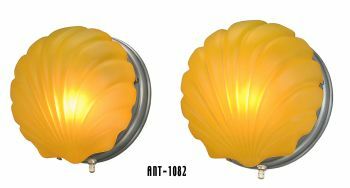 We also under-powered the cut glass shades for the pictures, but with a strong bulb, they give an ambiance that is quite gorgeous. 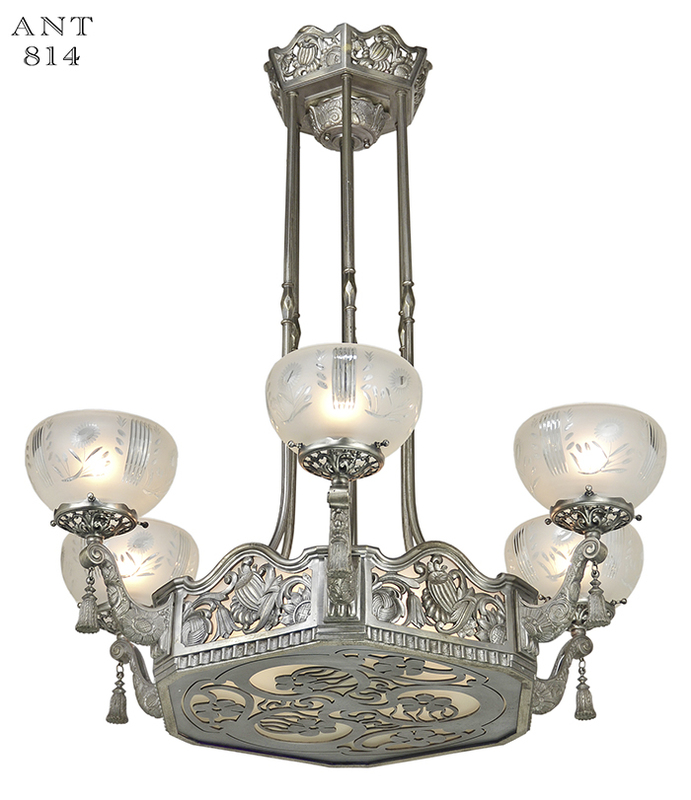 As mentioned, this chandelier has been completely re-wired in our UL shop with new American sockets and all new wire. 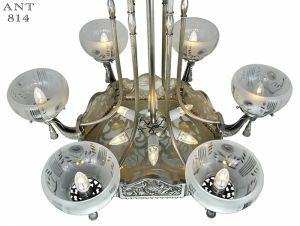 There are six normal medium base sockets within the center bowl and a socket in each rim shade, making a total of 12 lights. 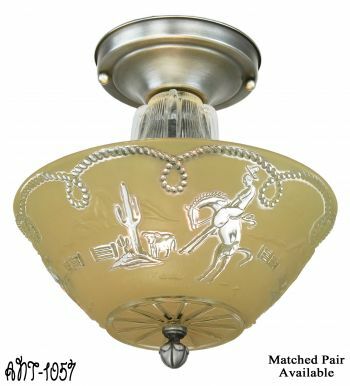 Mounting kit included. 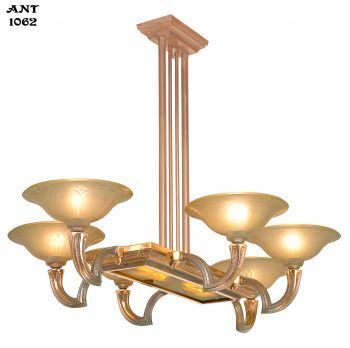 Price: only $4,250.00 plus careful packing & freight shipping. 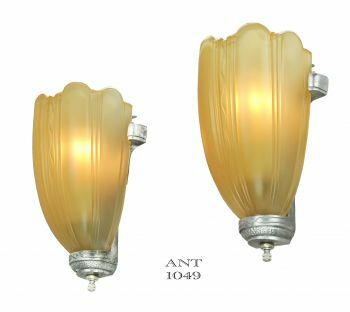 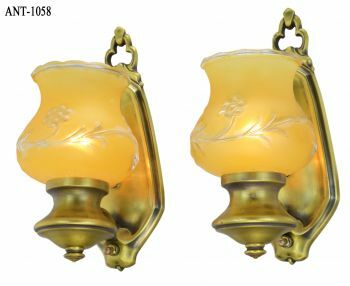 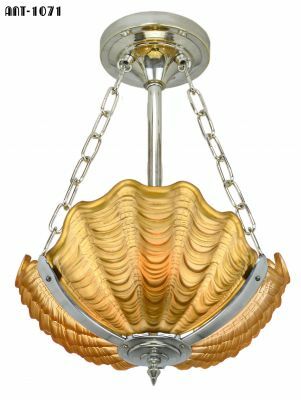 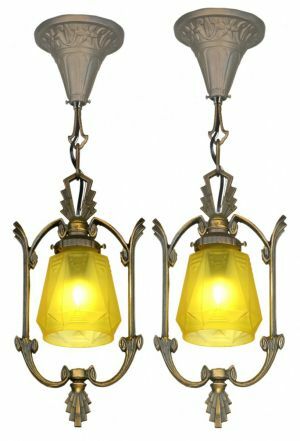 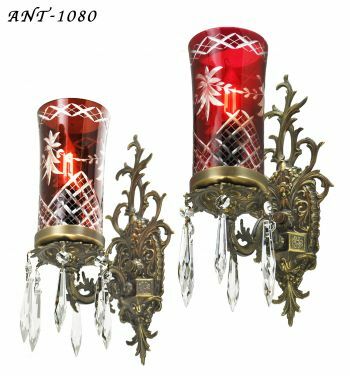 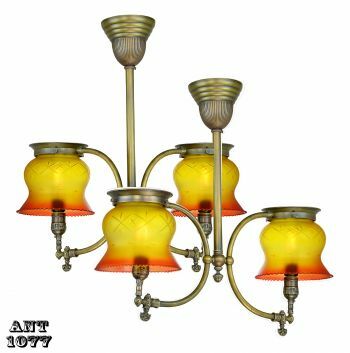 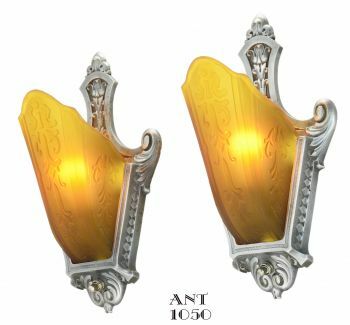 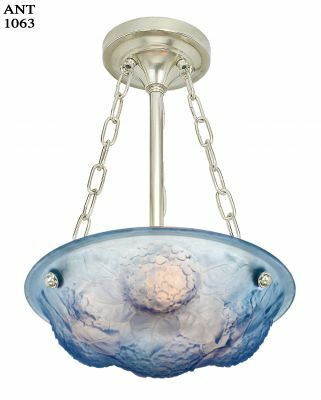 We say "only" because if you have done some chandelier shopping elsewhere, you will know that some folks are asking upwards of $10,000 or more for a fixture of this quality, and often, not as nice as this one. 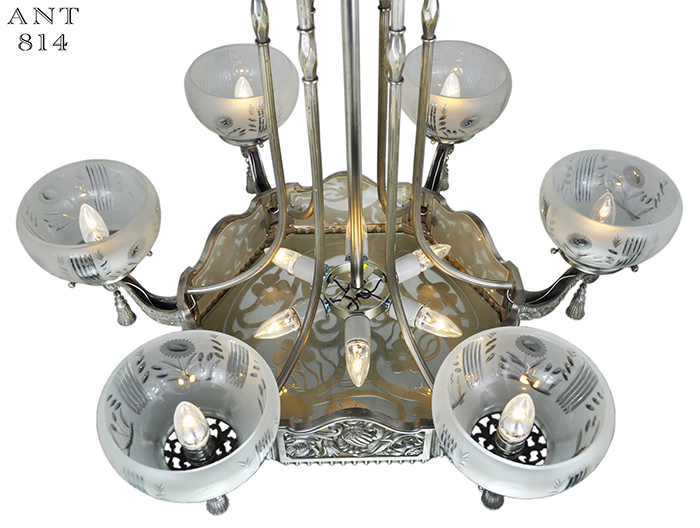 We're more realistic and believe that fair pricing is best.